Yes, willful and charming describes Yorkies to a T. Terriers are notorious for being territorial, so marking their "territory", aka your house, comes quite naturally to them. I've even seen terriers mark their owners/handlers at dog shows. Normally, I'd advise you to make a big, noisy deal about it when you catch your dog having an accident, but you're already scolding and it's not making a difference, so I have a few other suggestions you can try. First, you need to get the urine odor out of areas your dog has used before. Your pet will be drawn to these spots time and again as long as his scent remains, and urine crystals deep in the carpet will reactivate with even the smallest amount of humidity. Dog Urine Cleaners will be essential for salvaging your rug. Next, I'd begin crate training if your dog isn't trained already. You should find he's reluctant to soil this small area when he's confined, so he'll save it up. Then you should carry him directly outside so he doesn't have an opportunity to have an accident along the way, and give him a good long exercise outdoors before you bring him back in. Allow him to go several times, as he'll want to spread his scent around and won't empty out the first time. Then you'll need to be diligent when you bring him back inside. Basically, you will be re-housebreaking him since he didn't get it the first time around. Finally, if these first two measures don't bring success, you'll need to consider restricting your dog's run of the house when you don't have time to monitor him. Think of it as damage control and consider using a baby gate to confine him to an area without carpeting such as a kitchen or bathroom where his accidents will be easier to clean. 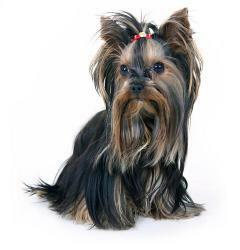 Unfortunately your vet is right, Yorkies and Terriers in general can be difficult to house train, even after spaying/neutering, and once they adopt the bad habit of going in the house, it's very hard to correct the behavior. Dog training books can sometimes be very helpful. I'm going to recommend you try reading How to Housebreak Your Dog in 7 Days by Shirlee Kalstone to see if you can adapt her advice to your situation.